COE Line scan cameras are designed to provide high-resolution images, using the latest High Res sensors that offer both quality and speed. The COE Line Scan cameras use the latest AMS/Awaiba Dragster sensors that offers unequaled sensitivity, bandwidth and signal-to-noise ratio. With advanced power control, the COE-8K and COE-16K can be used in large arrays with confidence. COE Line scan cameras are available with monochrome sensors and are Camera Link only. This guarantees the fastest and most reliable output that makes this camera ideal for large area flat-panel inspection systems, printed material inspection, PCB inspection and much more. The camera FPGA includes Photo Response Non-Uniformity (PRNU) which is used to correct the difference in pixel response and the change in response due to optical or light source differences. This correction guarantees the highest quality image. The M72 mount is ideal to mount our TC12K line scan lenses, and the MC12K macro lenses. 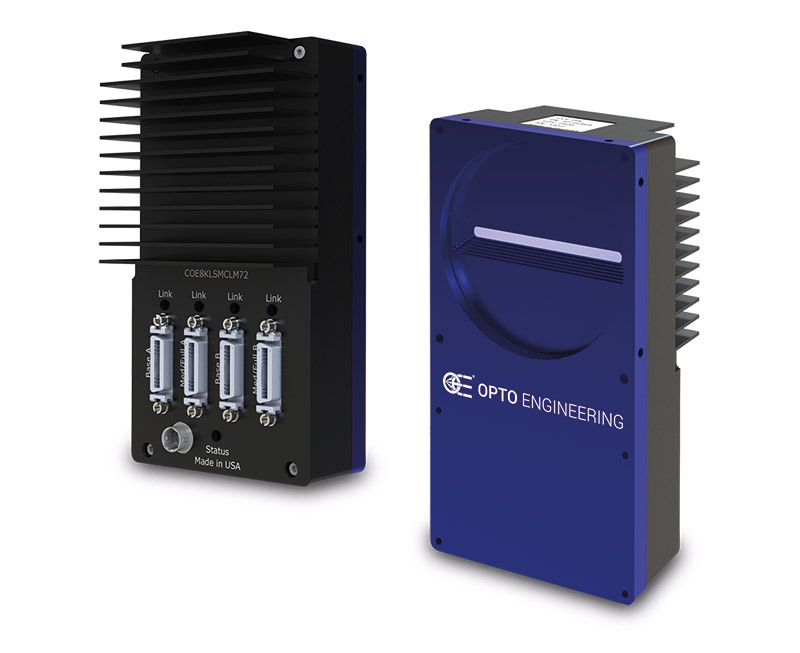 Combined with Opto Engineering® lenses and illuminators, we can assist in building a fast, reliable and cost effective system. Ideally suited for the inspection of large-area flat panel displays and document scanning. With advanced power control, the COE-8K and COE-16K can be used in large arrays with confidence. Dark Signal Non-Uniformity (DSNU) Correction is used to correct dark field offset within the sensor. Photo Response Non-Uniformity (PRNU) is used to correct the difference in pixel response and the change in response due to optical or light source differences. Provides maximum speed and resolution. On-board user data storage provides customizations for advanced applications.